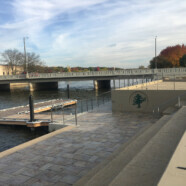 Janesville Town Square now open | Vandewalle & Associates, Inc.
JANESVILLE, WI–Janesville’s new Town Square is now open to the public. Shown are photos of the completed project Vandewalle & Associates worked on with the City of Janesville and Strand Associates. 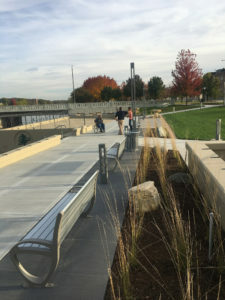 The project includes a number of components along both sides of the riverfront, including a stepped seating and performance area, pedestrian bridge, lighting, and water feature.